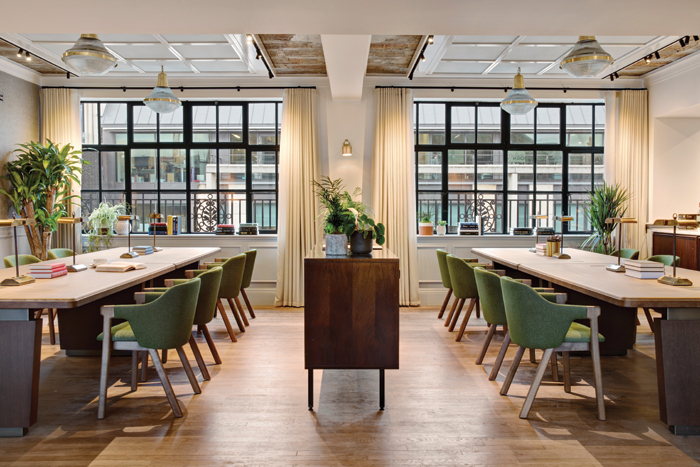 Interior design firm AvroKO has completed the restoration of a Thirties’ art-deco building in London’s Fitzrovia, home to new multipurpose venue and members club Maslow’s Mortimer House. The venue takes part of its name from American psychologist Abraham Maslow, whose theory about human motivation and happiness – called ‘the hierarchy of needs’ – inspired the immersive, hospitality-led concept developed by the club’s founder, former hotelier Guy Ivesha, whose company is also called Maslow. Maslow (1908-1970) divided human needs into five categories, presented as a pyramid, with biological and physiological needs at the bottom. Next up are needs for safety, love and belonging. Over these are needs for esteem, including personal esteem and desire for respect from others, and finally, self-actualisation. In addition to getting the concept right, the AvroKO team was challenged by the architecture of the building, which had been used as an office since the Seventies. 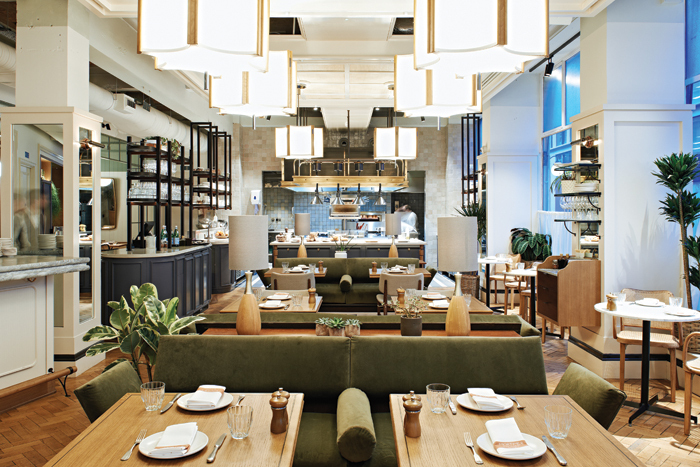 ‘It was a challenge to adapt the old commercial space into a food and beverage space while also putting in modern elements, such as elevators, and carefully protecting the original details,’ says Greg Bradshaw, principal at AvroKO. 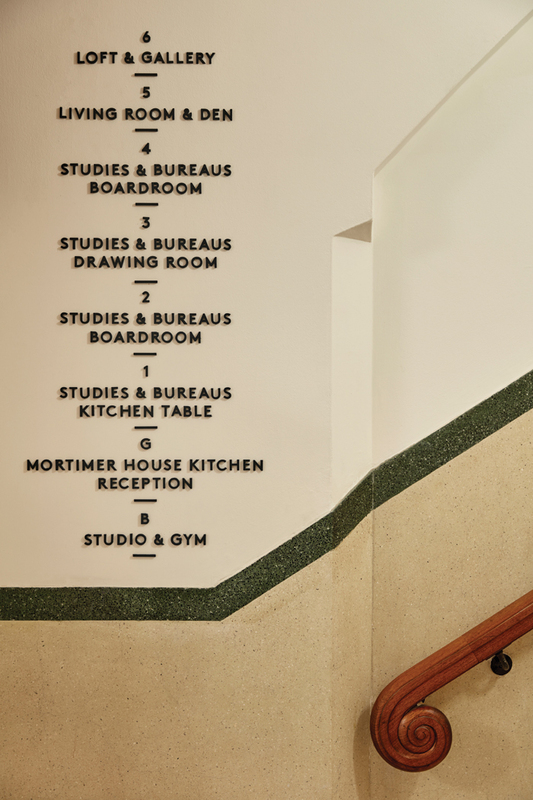 Mortimer House includes both public and private spaces: a restaurant and a penthouse event hire space are open to all, while members-only areas include a gym with a yoga studio, four floors of workspace, a bar and a lounge. The gym, yoga studio and the ground floor restaurant correspond to the base level of Maslow’s hierarchy, representing the physiological needs of the individual. The gym and yoga studio take up the basement floor but feature both artificial and natural lighting, made possible by glass tiles inserted into the Mortimer Street pavement. The Mortimer House Kitchen restaurant features an open kitchen and bespoke sofas designed by AvroKO, as well as vintage rugs and a conservatory extension. During the refurbishment process it became clear that many of the building’s original features, such as mosaic floors and timber panelling, were hidden under layers of carpet and behind plaster walls. AvroKO revealed the building’s physiology by exposing some of the hidden original details, thus bringing it into focus. As examples, the members’ entrance boasts a restored marble mosaic floor and a fireplace with intricate timber panels, while the original terracotta ceilings and wooden floors are visible throughout the building. The psycholgist’s social ‘belonging’ level is represented by co-working spaces across four floors. These include private studies, individual bureaus, various meeting rooms and communal living rooms, to inspire socialising. There is also a traditional tea trolley service, encouraging members to gather for refreshments. Mortimer House is full of nooks and crannies that inspired and challenged the designers. 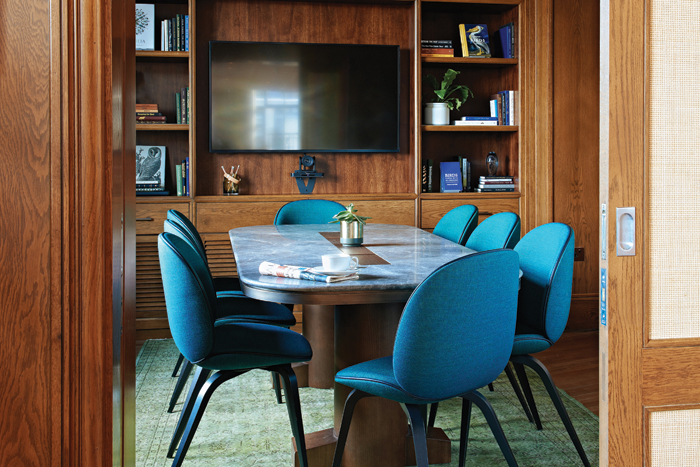 While bespoke furniture had to be created for some corners, the strategically placed breakout areas prove a comfortable space for a private conversation or chance encounter. A kitchen area is fitted with a dumb waiter to deliver food straight from the restaurant. Private phone calls can be made in plush phone rooms, fitted with chairs and small desks. Kitchen Table, a first-floor meeting room, is laid out inside a kitchen space, providing a creative meeting space for those seeking inspiration. The fifth floor is the location of the Living Room and Den, inspired by the Maslow hierarchy’s esteem needs. Celebrating human curiosity, it features a central bar, two fireplaces and an eclectic mix of vintage and modern furniture. Sliding doors lead to a meeting room decorated on the theme of birdwatching. The choice of natural colours and patterns for the furniture and calibrated spotlights create a comfortable space, bringing AvroKO’s hospitable thinking into an office environment. Latin American influences are also present, not least in the lush green plants placed around the building as well as the natural materials palette used. Green plays a large role in the whole decor, as green sofas, fireplaces, tables and original tiles can be found throughout, including the main staircase. The sixth floor is given to the Loft & Gallery, an event space that also doubles as a members only quiet area and a gallery for art installations. This floor reflects the hierarchy’s need for self-actualisation and its simple, clutter-free, whitewashed design is suitable for quiet reflection. 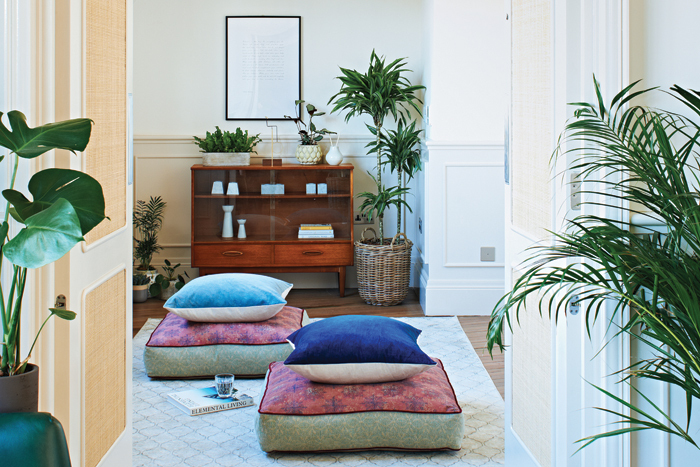 The penthouse floor also has a Meditation Room for further breathing space. Natural materials and neutral colours are used throughout, including wall-mounted green leather sofas, made to AvroKO’s custom design. The fifth and the sixth floors have balconies added by AvroKO, with the tiled floors and black railings fitting perfectly with the style of the building.